Coldtainers are new portable cooling containers from Coldtainer USA that provide temperature-controlled transportation. They are available in 2 models of either front opening or top loading and they provide different cooling, freezing and heating options. The portable containers all feature an integrated battery monitor and a digital display for viewing temperature and status. Coldtainers also can record temperatures and they have Bluetooth capabilities for downloading data. Coldtainer USA, providers of portable containers that can be used for precise temperature control in any transportation application, today announced the availability of a new highly versatile and reliable solution for temperature-controlled transportation. “Coldtainers are a very flexible and convenient solution for professionals who have to transport perishable goods while still maintaining health and safety standards,” said Terry Koerner, general manager of Coldtainer USA. “The direct expansion refrigerated containers are a portable and cost effective technology for transporting food, medical and pharmaceutical supplies when precise temperature control and freeze protection capabilities are needed. Available in front opening or top loading models in a range of capacities and with numerous cooling, freezing and heating options, Coldtainers can use battery, shore and solar power sources on vehicles and at facilities to operate on AC or DC power. Equipped with refrigeration units designed to withstand vibrations related to vehicle use, the stand-alone containers are made from highly durable molded polyethylene and food-grade materials, are easy to clean and are in compliance with health and safety standards. All Coldtainer temperature controlled container models feature an integrated battery monitor and a user-friendly digital display to view temperature and status, and for precise temperature set point control. 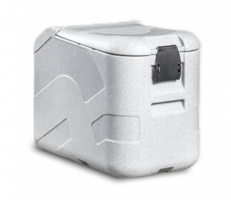 The portable cooling containers also record temperatures and have a mobile Bluetooth capability for downloading data to meet recordkeeping requirements. Reusable Container protects eggs during transport.